We offer the latest technology in electrical diagnosis and repairs. We service all types of electrical systems which include your vehicle battery, charging system (alternator), starter, and any other electrical diagnostic and repair your vehicle may need. We offer 2 and 4 wheel computerized alignments exclusively using Hunter equipment for all of our vehicle alignment services completed. We can set and adjust camber, caster and toe per the recommended manufacturers’ o.e.m. specifications for your particular vehicle. When we service your vehicle, all of our alignments include a computerized print out of the measurements taken both before and after all alignment adjustments are initially taken and then completed. Our ASE certified technicians will review this Hunter computerized alignment report directly with you at time of customer pickup. A common question and answer concerning when to align a vehicle would be that your vehicle alignment should be checked and inspected at least once every 12-months or 12,000 miles. It is also important to understand that improper alignment is a major cause of premature tire wear. Gas mileage is increased as rolling resistance decreases. Our shop utilizes the very best computerized alignment equipment manufactured by Hunter, the industry leader in vehicle alignment equipment and technology. See your owners’ manual for Specific mileage recommendations for your vehicles tune-up service schedule related to your current specific mileage interval for your specific engine, year, make and model. A frequently asked question and answer regarding tune-ups is that concerning timing belt and water pump replacement requirements. It is important that you understand that timing belt and water pump replacement mileage points are a critical factor when maintaining your vehicle under manufacturers’ specific maintenance interval guidelines. If you cannot find this information in your vehicles owners’ manual, please know you can you consult our North Scottsdale Auto Service ASE certified technicians for a computerized print out of what your specific manufacturer recommends for your current mileage point, engine, year, make and model. We offer a complete vehicle inspection prior to commencing on authorized repairs for any tune-up customer request to make certain that nothing is overlooked for your safety and the continued manufacturers’ o.e.m. recommended maintenance schedule for your specific vehicle. Your vehicles engine is like your body, it must have unrestricted air and fuel flow in order to function effectively. The problem that we most often encounter is dirty fuel injectors either spray off center, drip or clog completely. Just like a bottle of hairspray, deposits in the intake and combustion chambers can build up and block airflow, so that your vehicle cannot breathe properly. This automotive asthma can cause hesitation, stalling, knocking, pinging, rough idle, loss of power and high exhaust emissions, not to mention poor fuel economy. The solution is that every 12-months or 12,000 miles, carbon, gum and varnish should be removed from the engine by having our 3 part multi-step fuel system cleaning service completed. This service is designed to remove accumulated deposits from the fuel injection system by cleaning engine intake valves, ports and manifold. In most cases, the results include a significant reduction in emissions, a noticeable increase in performance as well as improved gas mileage. A common question and answer regarding when fuel induction service should be completed is that most manufacturers recommend that your fuel induction system be serviced every 12-months or 12,000 miles, whichever comes first. North Scottsdale Auto Service llc offers a 3-step fuel induction service, which includes a fuel system cleaner, injector cleaning and throttle body cleaning. We service all ( D.I .) direct injected, ( F.I. ) fuel injected, multi-port injected and carbureted engines. Our fuel system cleaner is specifically designed to clean your vehicles fuel system by dissolving varnish, carbon and gum deposits. Our cleaner contains highly effective detergents to thoroughly clean fuel injectors and carburetors, intake valves and combustion chambers. This will in turn lower your exhaust emissions, scavenges water, lubricate upper cylinders, valves and rings. We offer Decarb engine service of your vehicles motor by loosening and breaking up any carbon build up that has formed on the tops of your pistons, underside of your heads and flats of the valve assemblies. We will remove and replace your fuel filter according to the manufacturers’ o.e.m. recommendation found in your owners’ manual. Most manufacturers recommend differential fluid to be serviced at the specified service intervals in your service manual. It is important to know that if your vehicle is used for towing, the differential fluids should be serviced more frequently. When you service your front or rear differential, you are extending the service life of your differential by protecting against rust and corrosion in the differential. The harmful effects of oxidation deterioration due to heat and high speed driving is further minimized. By reducing differential wear and gear flaking through this service, your lubrication within the differential is increased by reducing the possibility of higher speed gear oil foaming. You will also maintain your vehicle warranty service requirements under the manufacturers o.e.m. recommendation service interval for your specific year, make and model. Most manufacturers recommend power steering fluid to be serviced at a specific service interval according to the manufacturers’ o.e.m. recommendation found in your owners’ manual. When you service your power steering, also known as a "power steering flush", you can prevent premature wear and tear on vital parts, we remove varnish buildup, harmful deposits and impurities, all while conditioning and revitalizing your power steering seals by flushing the system. Our ASE technicians will then replace the power steering system with new o.e.m. specific fluid and add conditioner. This is the best guarantee you can have with the future maintenance, avoiding costly repairs and optimizing your power steering system by allowing the new power steering fluid to run effortlessly throughout the entire system of your vehicle. Furthermore, it can help prevent further deterioration and potential future power steering leakage. Most manufacturers recommend transmission fluid to be serviced at a specific service interval according to the manufacturers’ o.e.m. recommendation found in your owners’ manual. It is important to know that if your vehicle is used for towing, the transmission fluid should be serviced more frequently. When you service your transmission, also known as a "transmission flush", our ASE technicians will clean your internal transmission components and remove abrasive wear metals and debris. By preparing your transmission for new fluid, your transmission service will clean away harmful sludge, varnish and deposits. It will also help to extend transmission o-ring and seal life. Our automatic transmission treatment will reduce friction and wear, rejuvenate seals, restore lost additives and increase component life as well as protecting your transmission against heat and stress. Furthermore, this treatment reduces oxidation and fluid breakdown, resulting in a smoother, quieter shifting transmission. Most manufacturers recommend transfer case fluid to be serviced at a specific service interval according to the manufacturers’ o.e.m. recommendation found in your owners’ manual. It is important to know that if your vehicle is used for towing, the transfer case fluid should be serviced more frequently. When you service your transfer case, you are extending the service life of your transfer case by minimizing the harmful effects of oxidation deterioration due to heat and high speed driving. By reducing internal transfer case wear and gear flaking through this service, we can maintain your seals and bearings. You will also maintain your vehicle warranty service requirements under the manufacturers’ o.e.m. recommendation service interval for your specific year, make and model. We offer inspection and replacement of your constant velocity ( CV ) joint boots, axels and joints. Call 480.588.5274 North Scottsdale Auto Service for the best quality, service and prices for all of your vehicle needs! 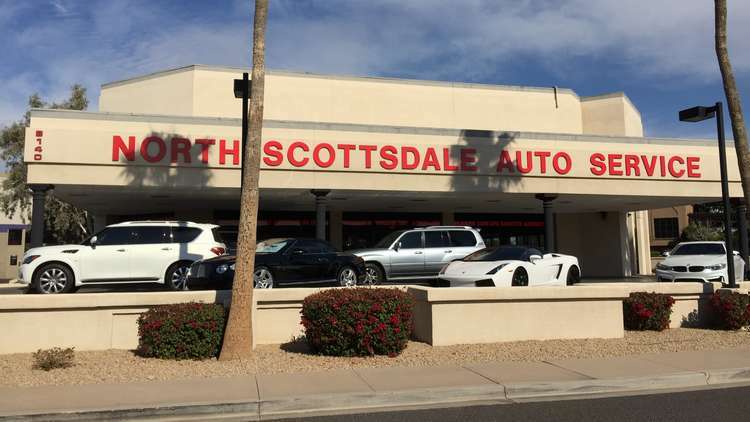 North Scottsdale Auto Service offers extensive professional automotive services such as hail damage, auto body shop and collision center repairs, paintless dent repair, extended car warranties, auto detailing, automotive glass replacement along with quality automotive car care and performance products to Scottsdale, Arizona and the surrounding metro Phoenix area communities.